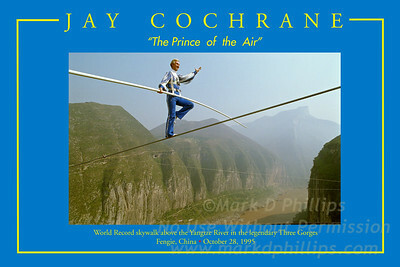 Jay Cochrane skywalks above Niagara Falls, Canada between the Niagara Fallsview Casino Resort and the Hilton Hotel on 14 June, a distance of 650 feet and 400 feet above the ground. Cochrane will perform the skywalks between the hotels daily beginning June 17, 2005. 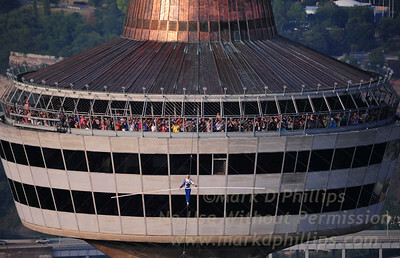 The daily walks are a prelude to the "Skylon Tower" skywalk beginning July 1st which will begin at a height of 400 feet atop the Niagara Fallsview Casino and traverse a distance of 1,800 feet where Jay will step off the wire on top of the Skylon Tower, more than 600 feet high.